Gov. Andrew Cuomo and Cynthia Nixon engaged in a fiery debate Wednesday evening. New York Gov. 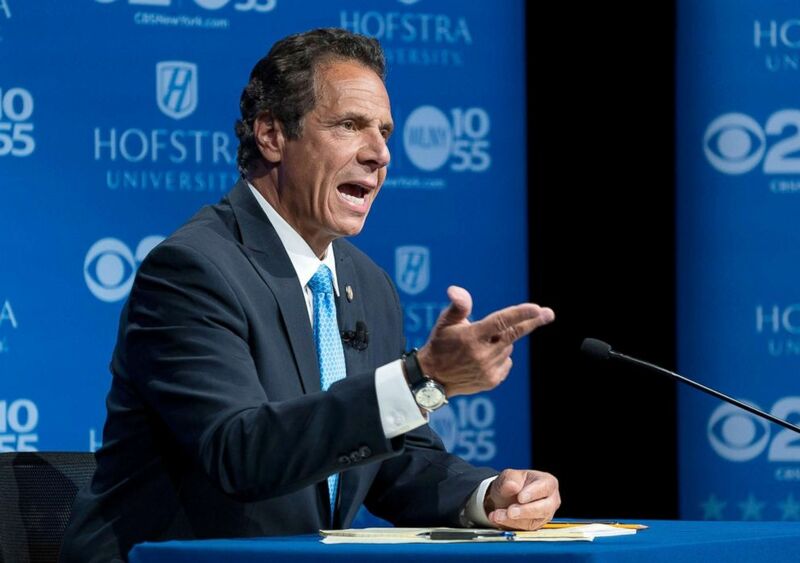 Andrew Cuomo and Cynthia Nixon engaged in a fiery debate Wednesday evening at Hofstra University where they sparred over President Trump, experience, and infrastructure. Cuomo, who is seeking his third term as New York Governor, pledged not to run for President against Donald Trump in 2020, instead pledging to serve four full years as governor, if re-elected. "I'm running for Governor, not President," Cuomo said. Cuomo added that the "only caveat is if God strikes me dead. Otherwise, I will serve four years as governor of the state of New York." Cuomo's pledge comes two weeks after Cuomo and Trump engaged in a war of words after Cuomo made a jab at Trump's 'Make America Great Again' slogan saying "We're not going to make America great again, it was never that great." The President slammed Cuomo on twitter writing "How does a politician, Cuomo, known for pushing people and businesses out of his state, not to mention having the highest taxes in the U.S., survive making the statement, WE’RE NOT GOING TO MAKE AMERICA GREAT AGAIN, IT WAS NEVER THAT GREAT? Which section of the sentence is worse?" The hour-long debate, the only one before the September 13 primary, was filled with plenty of heated exchanges where Nixon and Cuomo interrupted each other, scolded each other, and hurled insults at each other. Asked why she was running and what in her background would give voters confident she could run the state, Nixon reminded the crowd that she is a life-long New Yorker and touted her activist background, organizing rallies and meeting with legislatures for public school funding, as well as working for a group that "laid the groundwork for marriage equality" in New York. 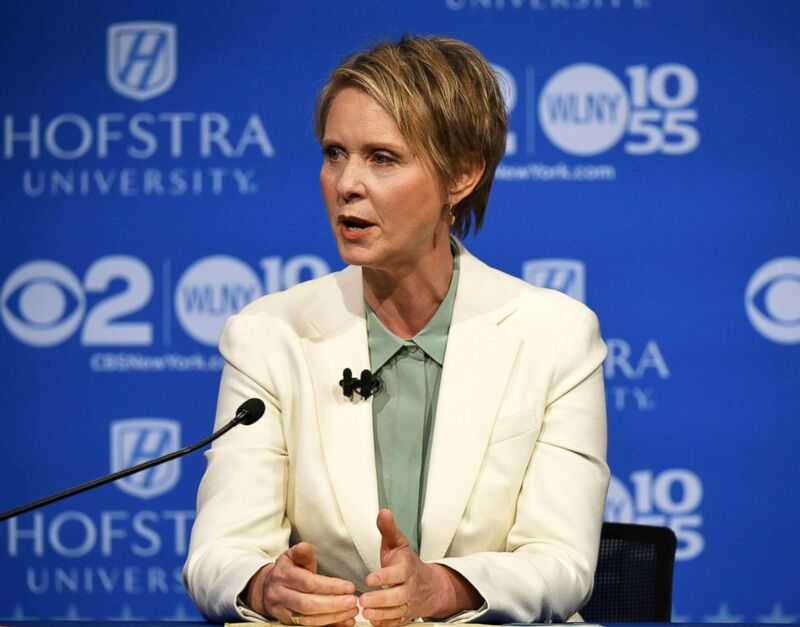 (J. Conrad Williams Jr./Newsday/AP) Cynthia Nixon speaks at the Democratic gubernatorial primary debate, Aug. 29, 2018, at Hofstra University in Hempstead, N.Y.
Nixon also hit Cuomo on his experience, saying "I'm not an Albany insider like Governor Cuomo, but I think that experience doesn't mean that much if you're not actually good at governing." Cuomo responded to Nixon saying "the governor of New York is not a job about politics, it's not about advocacy. It's about doing. It's about management. This is real life. Governor of New York you're running $170 billion budget." The two democratic candidates mentioned President Trump several times. Right at the start, Cuomo said that part of the job of New York's governor is to "fight Donald Trump, who is the main risk to the state of New York." Cuomo also cited Trump as part of the reason he won't run for President in 2020, saying, "But part of the largest threat [to New York] today is President Trump. He is attacking everything we believe in New York. He has to be stopped. I'm going to fight with him," Cuomo said. (Craig Ruttle/EPA via Rex/Shutterstock) New York Governor Andrew Cuomo answers a question during a gubernatorial debate with Democratic New York gubernatorial candidate Cynthia Nixon at Hofstra University in Hempstead, New York, Aug. 29, 2018. Nixon also invoked Trump's name as a reason for why she should be New York's governor, saying "when it comes to opposing Donald Trump in New York state, we already have a corrupt corporate Republican in the White House. We don't need a corrupt corporate Democrat in Albany as his main opposition. We need to oppose Donald Trump not just with rhetoric but with policy." Both candidates spoke about the need to improve New York's infrastructure. Cuomo touted his work on rebuilding New York City's airports, the new Mario Cuomo bridge, rebuilding New York City's Penn Station, as well as expanding the city's convention center, the Javitz Center. "We now have the most aggressive rebuilding program in the state's history. The most aggressive state program in the United States of America," said Cuomo. The two expressed the need to fix New York City's subway system which has been plagued with delays. Cuomo said he would cancel next year's fare hike because "the service is not what people deserve." Nixon hit Cuomo for the issues plaguing the subway saying "he's had seven and a half years to avoid this very avoidable crisis in our New York City subway and he has done next to nothing."